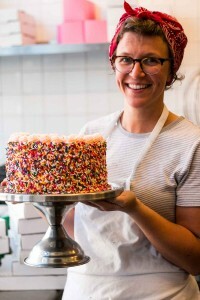 I recently did an event with Deb Perelman for our new books, L’appart and Smitten Kitchen Every Day. We’d both been traveling around, and not one, not two…but three times, we were in the same city at the same time, but didn’t see each other. One night, I was having dinner by myself before an event and after a two-hour slog through traffic, I needed a sip of something. While inching along on the clogged freeway, I’d sent her a text message, asking if she drank anything before events. She said no. On my last book tour, I kept my coffee consumption to one cup in the morning, and no more than a small sip of wine in the evening, because I was balancing a lot of travel with a lack of sleep, and wanted to stay on an even keel for my events. So I heeded her sage advice. When our worlds eventually collided in New York City, where we did an event together, during our conversation on stage, one of us asked the other, “What condiment would you invent?” (Or perhaps it was a question from the audience? Lack of sleep will do that to you…) I didn’t say it at the time, but I always wanted to invent a spray-on tart dough, which could be applied to a tart pan or pie tin, then baked up into a buttery crust with no mixing or rolling involved. You just spray it on, bake it, and fill it. 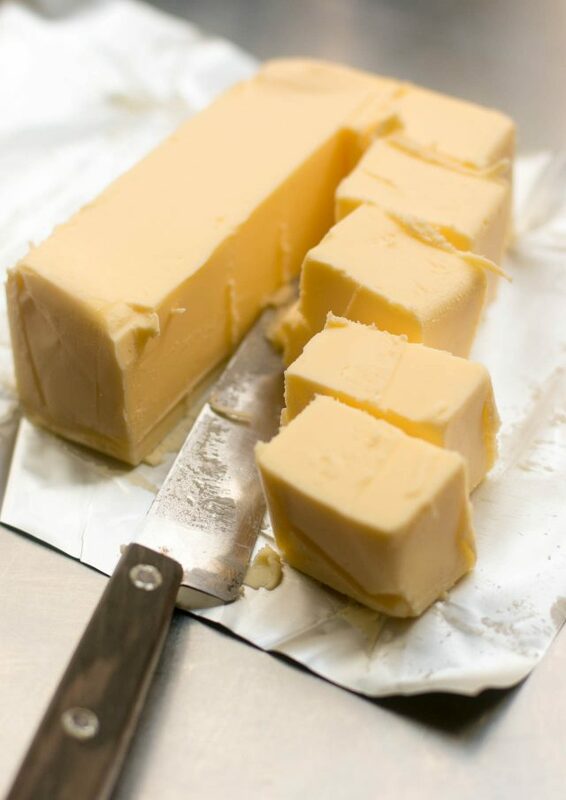 I don’t mind browning butter either, because it fills my kitchen with a nutty, rich smell as the butter sizzles and browns. The French call it beurre noisette because the aroma is reminiscent of toasted hazelnuts. And that’s a smell that’s always welcome in my home. I’d been thinking about Old Fashioneds for a while, ever since I had some caramel left over from a baking project and thought it would make an interesting base for a cocktail, but realized that such a small amount probably wouldn’t have that much impact in the glass, so I decided to go in another direction, with brown butter. 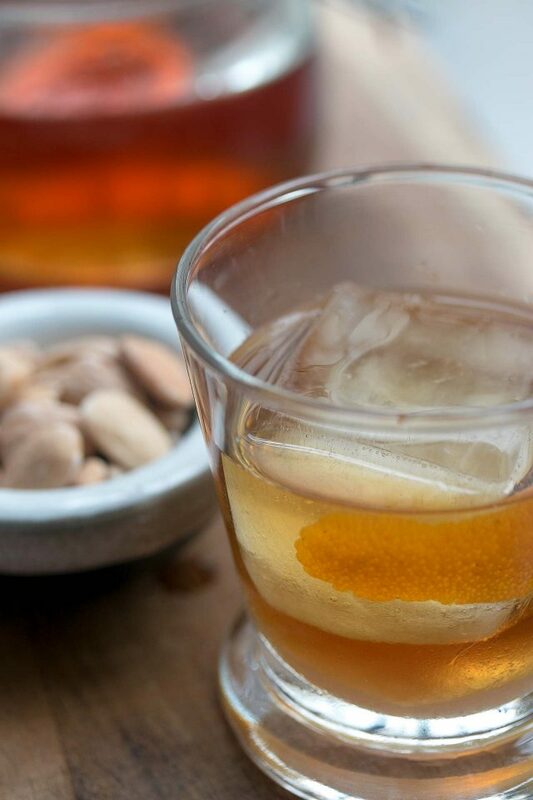 The great thing about the Old Fashioned is that it doesn’t require a lot of tools, or even ingredients. You just need three: Booze, bitters, and sugar. The cocktail is mixed right in the glass and you can even save on dishes by stirring the drink with your finger, rather than using a spoon, like my grandmother did with her drinks. In her defense, with four kids and working full-time, it’s no wonder by the time she got older, she developed strategies for doing less housework. It’s fashionable to say “butter-washed” or “fat-washed,” and when I first heard bartenders use that term, I just nodded in agreement, not wanting to look like a rube, when I had no idea what the heck they were talking about. In my defense, not sure how infusing liquid with butter or fat “washes” it, but I’m sure there’s a reason. But anything washed, or mixed, or infused, with butter, gets my vote. We’re in the midst of a butter shortage in France, which I thought was a lot of hooey, until I noticed the butter shelves in the supermarkets were especially sparsely stocked. Things don’t get stocked with the same earnestness in France, but butter is important enough here so that it’s a priority. And I was worried, even though Le Monde newspaper called it un grand bluff. Still, I couldn’t toss the precious butter after I had infused the bourbon, so I saved it and will be posting a recipe to use it shortly. In the meantime, I’ve been enjoying these Brown Butter Old Fashioneds. I like bitters but they can quickly overwhelm a drink. So be sure to add just two small dashes to the glass. Rye can be substituted, which, like bourbon, has a nice affinity with brown butter, so that can be “washed” (or infused) instead. 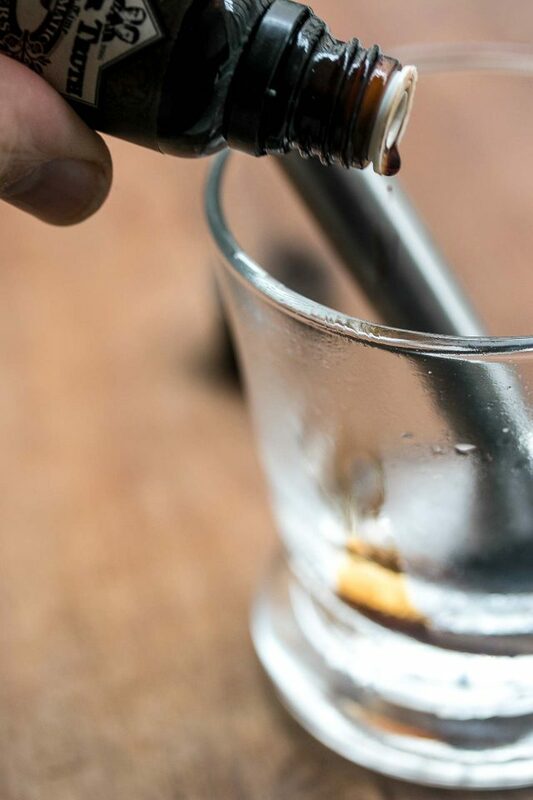 Bartenders usually use superfine sugar, which melts easily in liquid. In France, there are two kinds of sugar available at supermarkets; sucre en poudre and sucre cristal. I use sucre en poudre, which has finer crystals, and dissolve more easily. American granulated sugar falls somewhere in between. Baker's Sugar and superfine sugar are available in America, or you can make your own, if you want to get technical.But I've made these with regular granulated sugar and they come out just fine. So depending on your sugar, muddle it well with the bitters, until it's dissolved. Some bartenders add a very small splash of sparkling water to the sugar and bitters mixture, to help them meld together.I used Bitter Truth Aromatic Bitters for this one (another brand is Fee Brothers), although Angostura bitters are considered the classic, and available in well-stocked supermarkets and online. 1. 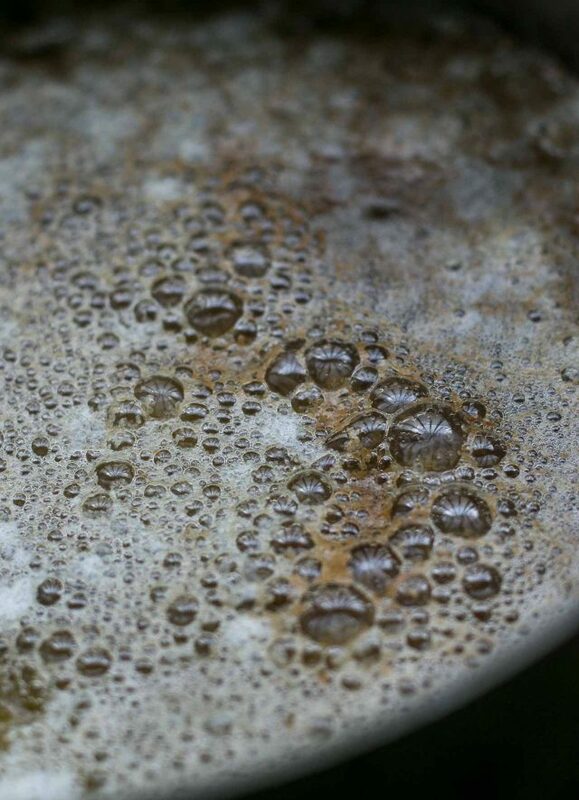 To make the brown butter bourbon, melt the butter in a skillet or wide saucepan over medium heat. 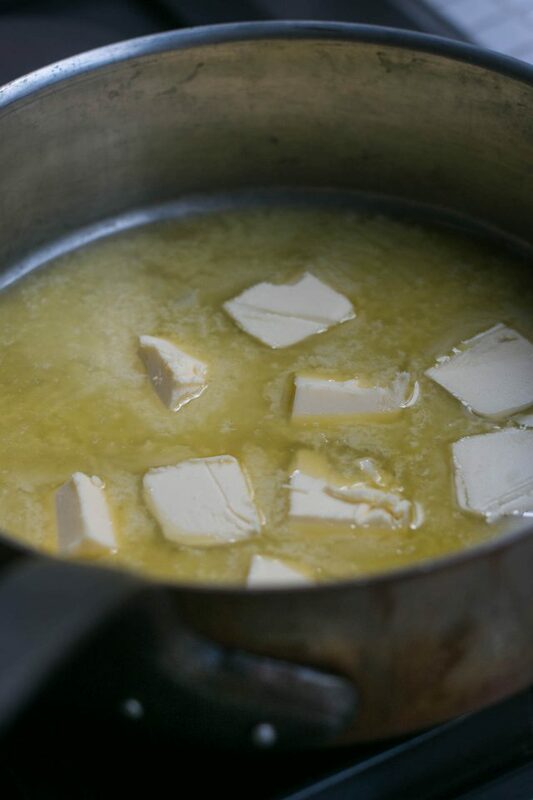 Continue to cook the butter; it'll sizzle and pop as it cooks, which is the water cooking off. 2. 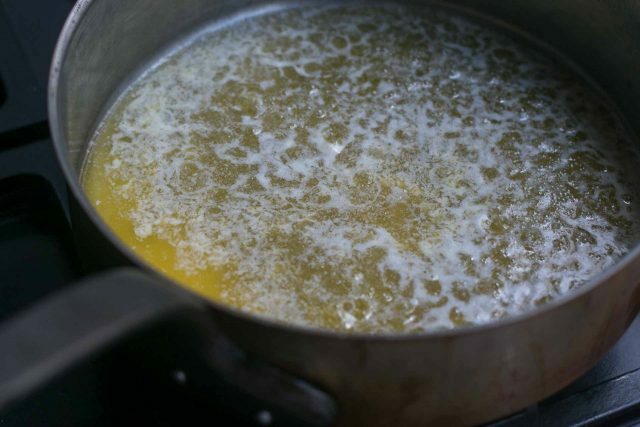 As the butter cooks, tilt the pan to avoid burning in spots. When the butter quiets down and has turned a nice amber brown color, and smells deliciously nutty, remove from heat and let cool until tepid. 3. 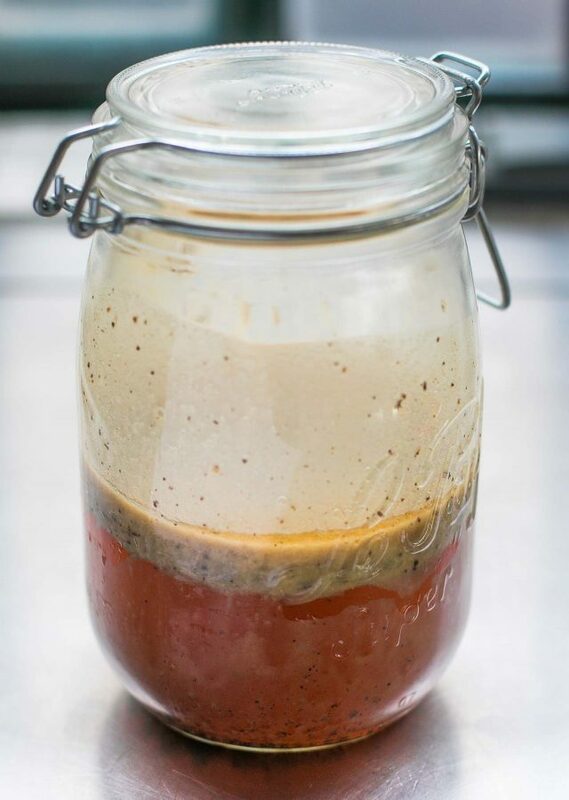 Pour the bourbon (or rye) into a jar, add the brown butter, close the jar and shake a few times to mix the butter with the bourbon. Refrigerate the bourbon for three days. 4. 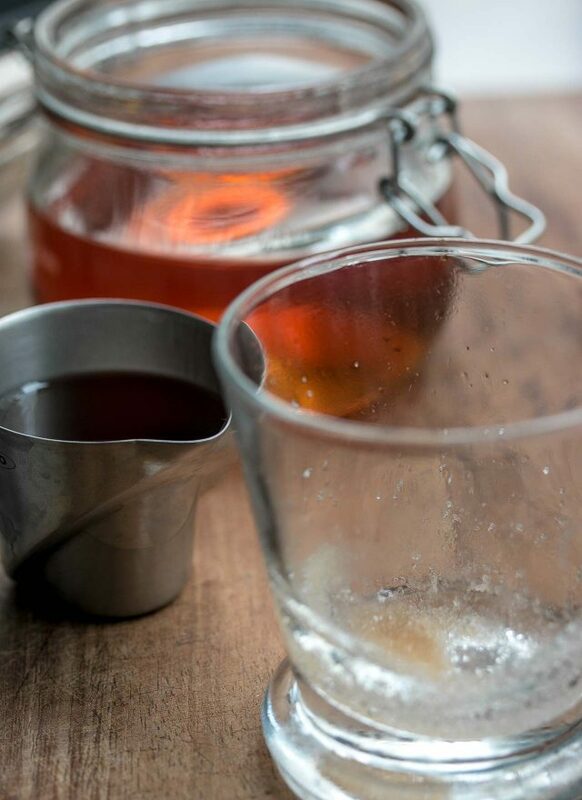 After three days, place the jar of bourbon in a saucepan with an inch or two of water in it. Very gently start to warm the bourbon over low heat in the water bath. As soon as the hard disk of butter on top is removable, lift it out (reserve it for another use, see Note at end of recipe). 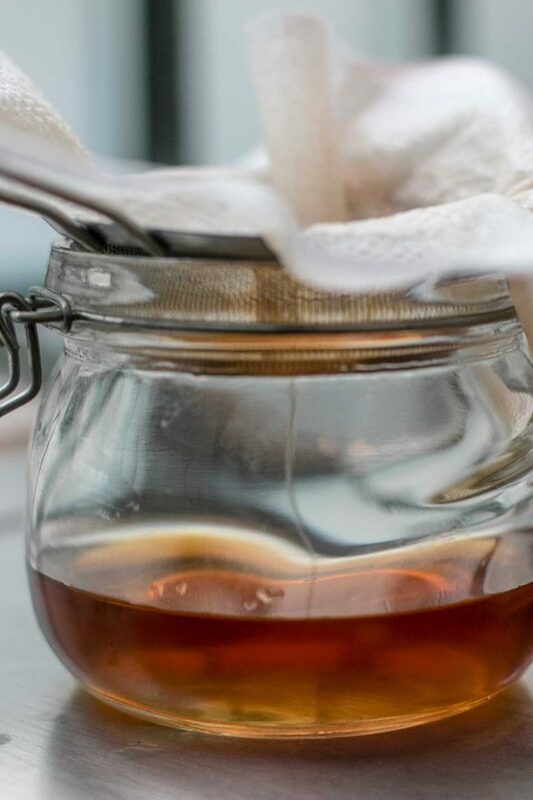 Line a funnel with a few layers of cheesecloth, a paper towel or coffee filter, set over a clean jar. Strain the bourbon into the jar. Chill the bourbon until ready to use. 5. 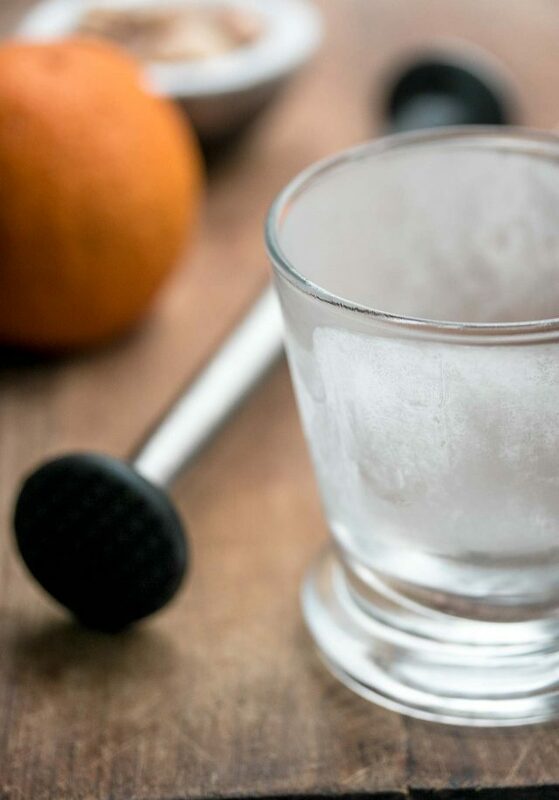 To make the Old Fashioned cocktail, use a muddler or back of a spoon to mix the bitters with the sugar in a squat cocktail glass, until the sugar is dissolved. 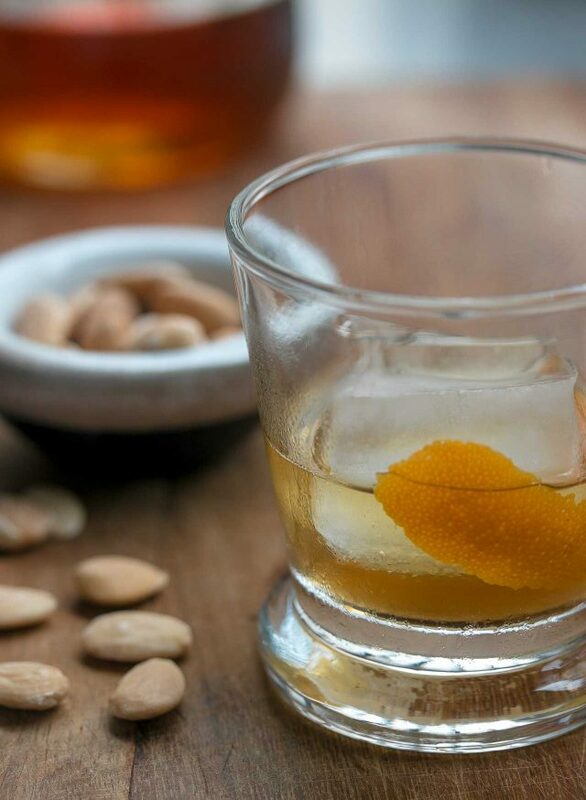 Add the bourbon and a large ice cube and stir for 15 seconds until the cocktail is well-chilled. 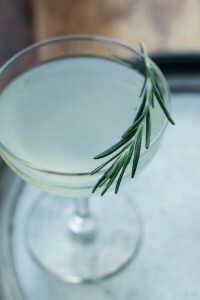 Twist a strip of orange zest over the glass, so the oils spray into the drink, drop the zest into the glass, and serve. Notes: Save the brown butter in the refrigerator. It can be used in recipes where brown butter is called for. I've got a recipe coming up on the blog for another way to use it. 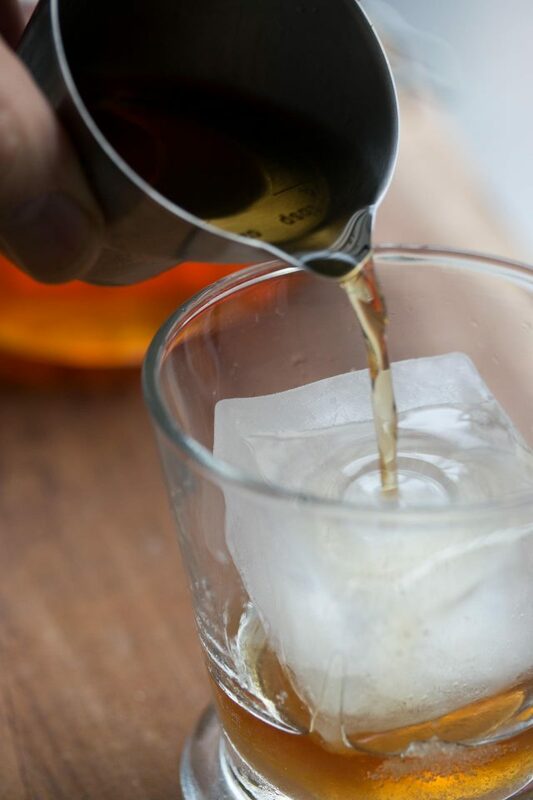 Large ice cubes are recommended for Old Fashioned cocktails, since they melt more slowly than smaller cubes, which dilute the drink. I own these ice cube trays, but you can also freeze water in a metal loaf pan until frozen, then break the rectangle of ice into large chunks, and use one of those. Storage: The brown butter bourbon will keep for several weeks in the refrigerator. how does a bartender do all that prep work? I had the pleasure of attending your 92Y event last week with Deb Perelman, and yes it was a question from the audience about the invented condiment. Both of you were so charming, no one wanted your conversation to end! Thank You! And good luck with the butter shortage. 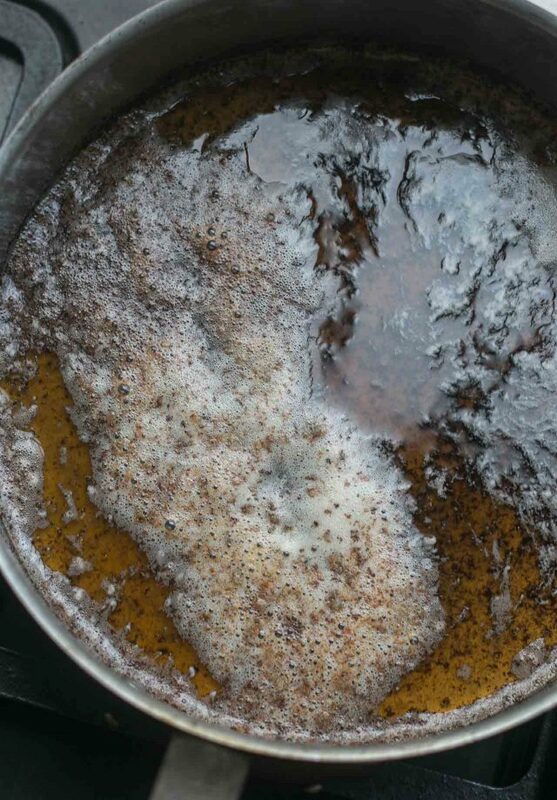 Someone has invented Deb Perelman’s dream – Tin Star Brown Butter. It’s AMAZING. Comes in a jar. Even has the tiniest bit of burnt milk solids on the bottom of the jar. David, I made your beef stew with olives from L’Appart and you say it serves 8 – no way! 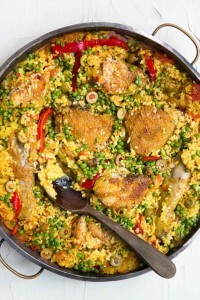 Not with everyone going back for seconds ;) delicious! David, a few advertisers take over your website when you click on the latest post to read the contents and they block the contents of your post. They appear to come from Amazon or Target and are difficult to delete. Yes! They are gone today! Glad I persevered and kept coming back – your posts are so good! Read your new book and loved your take on renovating in Paris. We bought an apartment in Montmartre 15 years ago but didn’t have to go through what you did. You are very brave! Hot buttered rum is one of our Christmas cocktails. We just add a pat on top, after warming rum with brown sugar, cinnamon, nutmeg, and cloves, thinned with a little water. Now I’ll have to think about infusing it with brown butter instead…. Speaking of the butter shortage in France, I found Salted French Butter in my Kroger Grocery Store (in the Midwest) today. It is from Private Selection which I think is carried in a number of chains in the States. It is made in Brittany “churned in the purest French tradition”. I compared it with the Bordier I brought back in September, and I must say it is pretty close. It doesn’t have the crunchy salt texture like Bordier, but the taste is good. $2.69 for a 7 oz. bar. If you can find it, maybe you should take some back to France with you!! David, what is your beautiful glass for the Old-Fashioned? I always am looking for the perfect Manhattan glass so this adds to my wish list. Hi David, I’m a huge old-fashioned fan (have you tried Bon Appetit’s version with a vanilla bean? Highly recommend) – anyways! I’m curious as to what kind of bourbon you used? Or more specifically, what price point of bourbon you used. Normally when I make a really bourbon-forward drink like this I’ll use nicer, smoother stuff (Buffalo Trace, Woodford) but for cooking/baking, I just use less expensive stuff (Bulleit). And this drink seems like it almost has one foot in each camp. Does infusing it mean you can get away with using something less smooth? Would love your opinion. In France, imported liquor is (naturally) more expensive so my everyday bourbon is often Four Roses, which is widely available. In the U.S., I like Old Forester, which is a brand that flies under the radar a little, but it quite drinkable. The thought of you and Deb crossing paths over and over without meeting up is a terrible Greek tragedy. It’s like the chocolate missing out on finding the peanut butter. Oddly depressing. The bartenders at the last restaurant I worked at had a cool trick. They’d brown the butter with extra powdered whey, then strain it when it was fully browned. The brown butterfat was given to us in the kitchen, and they infused the bourbon with the browned solids. They’d leave it to infuse for a few days, then strain the solids through cheesecloth. That way, they didn’t need to heat the bourbon to remove the fat cap, and the bourbon took on the flavor of the browned butter without any residual butterfat. Both ways work of course, but this seemed pretty cool to me. We got our whey through our produce vendor, but I’m sure it would be easy to find via Amazon if it couldn’t be found in a grocery store. Just wondering if the bourbon needs to stay refrigerated? I would think that straining out the fat solids and the high alcohol content would make it shelf stable (at least for an extended period of time)– am I wrong? Do you filter out the white bits at the top of the brown butter before mixing it in with the bourbon? Not sure what white bits your talking about, but I add all of the browned butter to the bourbon, only leaving behind the very dark bits that are stuck to the bottom of the pan.